I Know It Doesn’t LOOK Good, But . . . I Know It Doesn’t LOOK Good, But . . .About 2:30 Jan and I headed into Conroe to first have lunch, well, breakfast anyway, and then do some shopping. Jan has been seeing the Denny’s ads on TV showing their Holiday pancakes, Pumpkin Cream and Cranberry Orange. So she decided we were having breakfast for lunch. 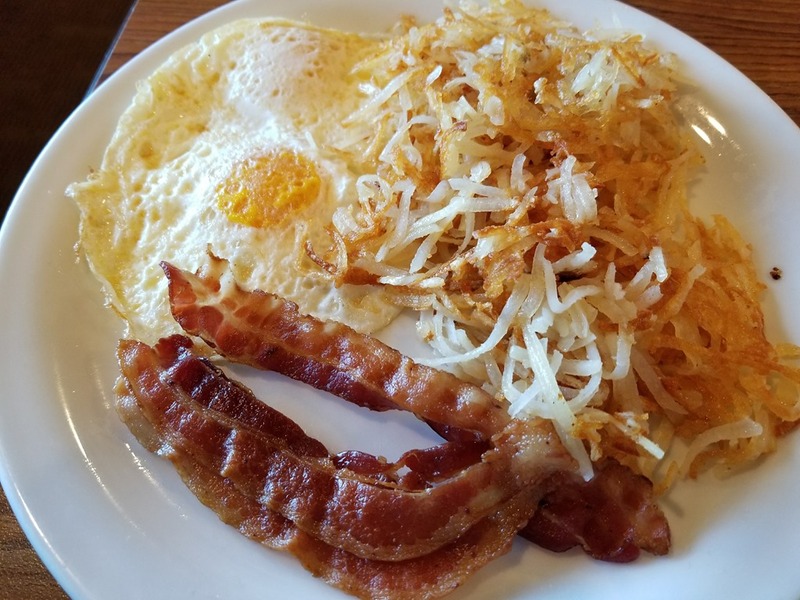 She got the Pumpkin Pancakes with the Cinnamon Cream topping, as well as eggs, bacon, and hash browns. 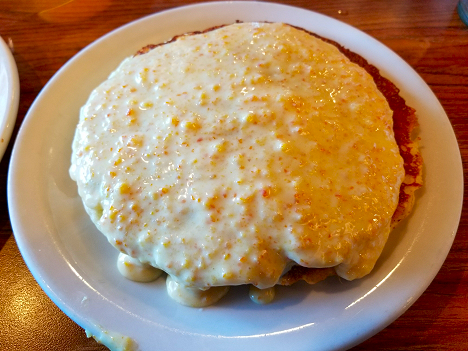 I went with the Cranberry Orange Pancakes with the Orange Glaze Cream sauce, also with eggs, bacon, and hash browns. I know in the photo that it doesn’t look that good, but the Orange Glaze Cream Cheese topping has bits of orange in it was delicious. Next up was a stop at Sam’s for a couple of prescriptions, and then Wal-Mart for some groceries before heading home. While I got all the groceries in, Jan walked next door to spend some time with the Evanses, et. al. while I tried to fix some client stuff that just broke. One of our blog readers, Snowbird, commented, reminding me of some info about Sears that I forgot to pass on yesterday. People talk about how Sears could have been Amazon by moving their catalog online if they hadn’t dropped the ball. But Sears actually had already dropped the catalog in 1993, just as the Internet was getting started. Amazon got its start the next year, 1994, selling books out of Jeff Bezo’s garage. And it actually might have been very difficult for Sears to put their catalog online. The necessary net infrastructure just didn’t exist. But anyway, corporate infighting had already doomed the Sear’s catalog sales model. The problem was that the stores and the catalog operation were too separate corporate entities competing with each other under the Sear’s umbrella, and they hated each other with a passion. The store side of things saw every catalog sale as one the store was losing, and the catalog group accused the stores of sabotaging the in-store catalog sales pickup. This was because although the stores got nothing from a catalog sale in-store pickup, they still had to supply the manpower to staff the in-store catalog operation. Finally in 1993, the store side of things managed to kill off the catalog, even though it was still profitable, by saying that the money would be better spent using it to expand and upgrade the stores. Now Sears seems to only exist as a real estate and product liquidation company. They’ve been selling off stores and real estate in a frenzy and sold off their fabled Craftsman tool brand to Stanley Black & Decker this past March, so can Kenmore be far behind? And today it was announced they’ve severed their 100 year old relationship with Whirlpool. So it looks like eventually it will all go down the tubes. Sad to see. “High Flight” is a famous poem by John Gillespie Magee Jr (1922-1941). A Royal Canadian Air Force pilot, he died at age 19 …in a mid-air collision during World War II. Here’s his brief poem — with a few notes now required by the Federal Aviation Administration. I’ve topped the wind-swept heights (13) with easy grace. Put out my hand (16), and touched the face of God. 2. During periods of severe sky dancing, crew and passengers must keep seatbelts fastened. Crew should also wear shoulder belts as provided. 9. “Hov’ring there” constitutes a highly reliable signal that a flight emergency is imminent. 12. Should any crewmember or passenger experience delirium while in the burning blue, submit an irregularity report immediately upon flight termination. 16. Pilots and passengers are reminded that opening doors or windows in order to touch the face of God may result in loss of cabin pressure. Military pilots shall avoid touching face of God to maintain separation of church and state as required by law.